Frederick Henry Henshaw (1807-1891) was born in Birmingham on 11 December 1807. 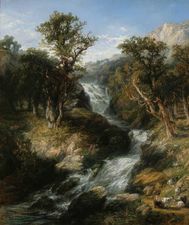 His earliest lessons in drawing were based on copies made by two of his brothers during classes taught by Samuel Lines. On attending the branch school of King Edward’s foundation in Shutt Lane, he received his lessons from Mr Downes. Then, on moving to the Grammar School in New Street at the age of 13, he came under the tutelage of Joseph Vincent Barber. A year later, he became apprenticed to Barber, alongside Thomas Creswick, among others. As a painter of landscapes, and occasionally of portraits and genre scenes, in both oil and watercolour, Henshaw gained a significant local reputation and, in 1826, helped establish the Birmingham Society of Artists. 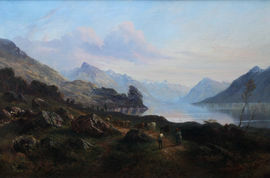 However, in the same year he moved to London, where he studied the work of Turner and other major landscape painters. This bore fruit in 1829, when he began to exhibit at such leading metropolitan venues as the New Society of Painters in Water-Colours, the British Institution and the Society of British Artists. Then, in 1833, he returned to Birmingham, settling at The Cottage, Green Lanes, Small Heath, his home until 1891. However, he continued to exhibit in London (until 1864) and made a number of sketching tours. The first and most substantial of these tours, lasting from 1837 to 1840, took in France, Germany, Switzerland and Italy. He died in Birmingham on 12 October 1891. 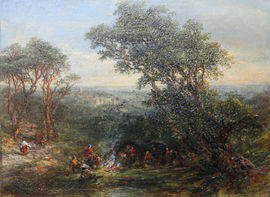 A retrospective of Henshaw’s work at Birmingham City Art Gallery in 1886 encouraged one reviewer to comment that his ‘forest pictures are amongst the finest works of one who has never been excelled as an English tree-painter’ (see Stephen Wildman, The Birmingham School: paintings, drawings and prints by Birmingham artists from the permanent collection, Birmingham City Museum and Art Gallery, 1990, page 6). His work is represented in the collections of Birmingham Museum & Art Gallery.